I have said to the raging, howling winds of adversity, “Quiet!” I have commanded the dawning of a NEW and BETTER day, says the LORD! Even as I was on the Mountain top and praying, I was watching My disciples struggling against the sudden storm that arose on the sea. They became weary of trying to make it to shore. That is when I came on the scene, walking on the water. I wasn’t threatened at all by the violence all around. I was in control all of the time, and I Am in control of the sudden storms that endeavor to impede your progress in Me. I Am on scene and on task, says the Lord, to bring this great calm in your life and cause the light of My countenance to shine through. You are on your way to the other side where your feet will step on solid, secure ground. No more being tossed around. No more insecurities. NO MORE darkness and enough of this defeat! I Am with you to insure your safety and well-being, says the Lord, and YOU ARE SECURE IN ME! This is a new day in Me, says the Lord. My light is not only on the path ahead, but upon you and in you! Joy in My presence is breaking through! It is a new day to rejoice in! I Am lighting up the way so you will have clarity in this day. You will SEE and you will HEAR. YOU WILL KNOW that I AM WITH YOU, and YOU WILL FEEL MY PRESENCE, says the Lord. Through the long night and the assailing storms you wondered where I was. Always, always with you, says the LORD, to insure your success. Did you think that I would allow you to sink in despair and drown in sorrow? Did you think that I would let the storm destroy you and your destiny in ME? IMPOSSIBLE, says the Lord. I care about you. YOU BELONG TO ME! I will NOT let you perish. Nor will I allow your destiny in Me to become unfulfilled. WHO IS IN CHARGE OF YOUR LIFE? I AM! Don’t forget that you gave ME your life, and it as well as you belong to ME. I TAKE CARE OF MY OWN. TRUST ME AT ALL TIMES. Storms? They come and they GO! It is just that simple, says the Lord. THEY GO! And as for you, My beloved, you remain secure and untouched and completely safe in Me. What I did in the past, I will do again for you. That means victory upon victory forever! That means that you will always make it through the darkness and the sudden and unexpected storms, because I will see to it, says the Lord. JUST enjoy the light of this new day and walk in it, for you are a child of the day and not of the night. You are a child of light and not of darkness. You are a child of victory and not of defeat. You are a child of life in Me and not of death. 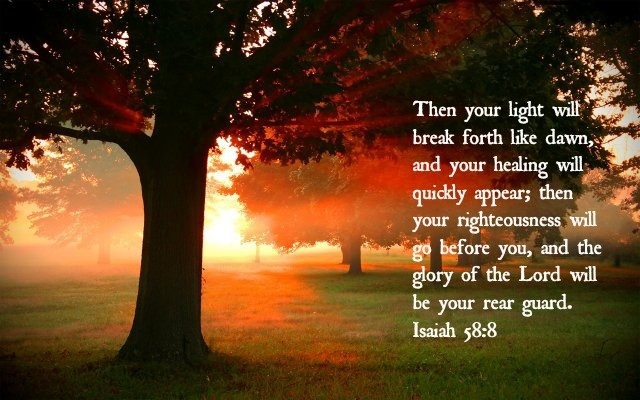 I Am breaking through all the darkness and I say, LET THERE BE LIGHT, says the LORD!